One of the most popular areas for sailing in Croatia, the region encompasses charming fishing villages, lively towns and secluded bays. From the glamorous energy of Hvar to the rustic charm of Scedro and the city of Split, there is more than enough to satisfy and cater to your every tastes and desires. Along the coast you can find plenty of secluded bays for a short swim or lunch stop, the harbours offer laid moorings and mooring buoys. The marinas are known to have the best facilities in Croatia. The area is ideal for sailing with reliable weather and steady winds. Hvar is an island that breathes eclecticism, by combining taste and style, antiquity and modernity, tradition and culture. With its lavender fields, ancient olive groves, vineyards and lively Hvar Town, Hvar is an absolute must to tick off for travellers exploring the Dalmatian coast. The afternoons are long and the nights even longer for those who wish to partake in Hvar’s energetic nightlife. Upon arrival on your yacht, you will find views of an extensive harbour, dappled with antique architecture and international travellers enjoying the seaside terraces. Situated on the eastern side of Bisevo, the small island to the southwest of Vis, the Blue Caves are a serene and beautiful natural wonder. Accessible by dinghy, there is a small fee for entrance, but the scene inside is well worth the admission price. 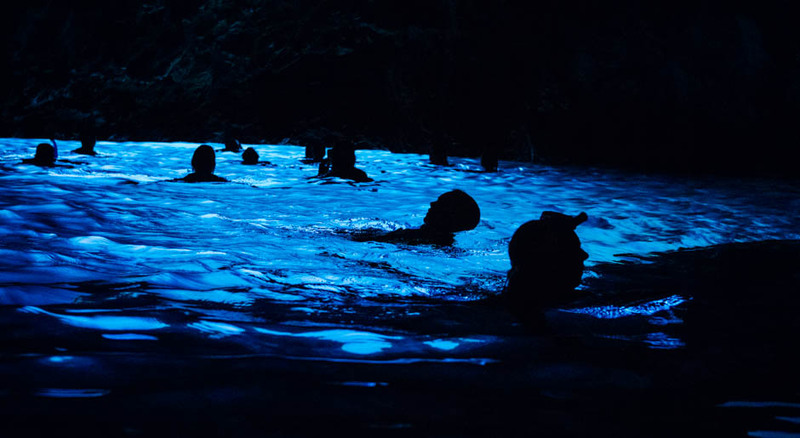 Between the hours of 11am and 1pm, the whole cave is filled with a glowing blue light, illuminating both the water and the walls. The experience is magical, exhilarating and well worth it! The town of Vis has a long promenade with restaurants offering delicious fresh fish and lobster. Taste real Croatian wine - locals claim it is the best here, so we highly recommend you try the restaurant Kaliopa where you will find a romantic and beautiful garden filled with palm trees and flowers. The island was only opened to tourists in 1994 as it was the old military headquarters. Vis has remained untouched and retained almost all of its varied historical architecture. The island offers many interesting sites - submarine docks, gun towers, and underground tunnels spanning the whole island. Check in at Marina Kaštela which is a 20-30 minute taxi journey from the center of Split or 10 minute taxi from Split airport. The yacht should be ready to set sail around 5:00PM so it’s best to arrive a few hours before. No need to prepare any food as your hostess will take care of the culinary delights. 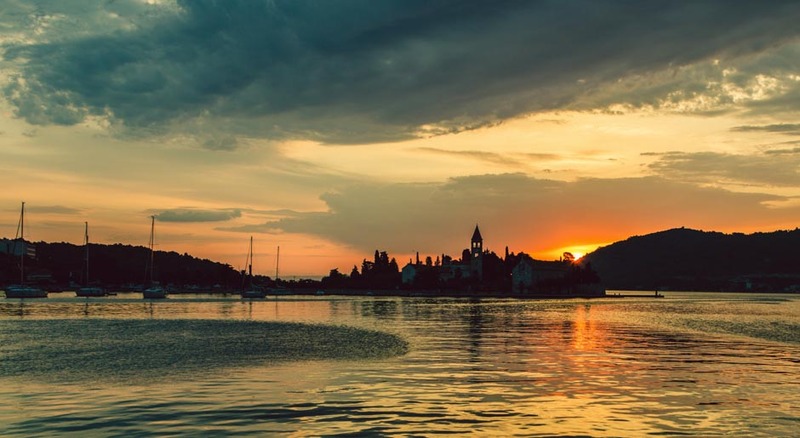 Being the first day, the sail will be a short breeze to Trogir, a beautiful UNESCO protected baroque city with great bays, restaurants and nightlife. Breakfast along the waterfront in Trogir before heading to Slatine Bay where you can hop into the serene seas to freshen up. 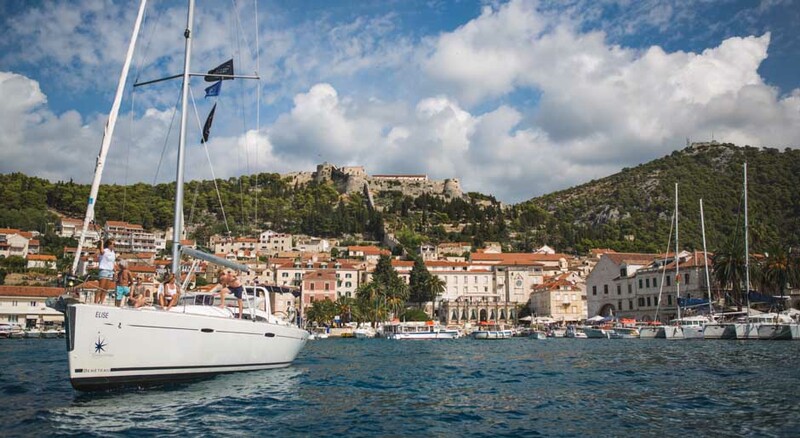 From there, you will enjoy a leisurely 2 hour sail toward the Island of Hvar while enjoying lunch on your yacht. Welcome to the St Tropez of Dalmatia! You’ll fall in love with the ambient atmosphere, cobble-stone streets and the array of fine restaurants and bars. Don’t miss sunset from the 16th Century Spanjola Fortress overlooking the city of Hvar. Delight in local Dalmatian cuisine at Dalmatino restaurant and then head out for an evening of cocktails and dancing at Hula Hula Beach Bar. Spend the day sailing around the island of Hvar and swimming in the countless bays that surround this stunning island. Dock in one of the small fishing villages on the surrounding islands, wander around and spark a conversation with the locals only to be overwhelmed by their generosity and kindness. Set sail for the Fire Islands (archipelago of seven islands called Pakleni otoci) to Saint Jerolim for breakfast before heading to the paradise that is Palmizana for lunch. The beaches are immaculate and the water is crystal clear making it an ideal location for swimming and relaxation. After lunch you will head to Stipanska for a glass or two of the delicious Croatian wines at Carpe Diem - be prepared for an unforgettable night full of dancing and laughter! An early start with a morning sail towards Vis Island with a stop at the Green Caves famous for their world class snorkeling. The reflection of the sun creates a spectacular array of blues and greens that line the interior of the cave; an amazing sight not to be missed. Once is all said and enjoyed, head to Vis Town to explore its rich history. For breathtaking sunsets over the Adriatic, head to the bohemian garden at Fort George restaurant, set inside a magnificent Fortress named after King George III built in 1813. Nothing quite like waking up to the sounds of the sea and the smell of breakfast aboard your yacht. Begin your pleasant cruise to the largest and most traditional island of Central Dalmatia, Brac. Enjoy a local lunch on the island before heading to the beautiful white spit, Zlatni Rat, one of Croatia’s most famous beach destinations. If you have some extra time, head towards the pristine bays and exciting nightlife of Baska Voda. Take a Swim at Tito's bay before visiting the vibey Diocletian's palace in the heart of Split, an extraordinary Roman ruin surrounded by restaurants, bustling bars and shops guaranteed to keep you busy from dusk to dawn. You can even visit old Roman ruins in Salona, which is a short taxi ride away from the heart of Split. If you haven’t had enough sun and sand, there is a great marina in Podstrana within Le Meridien Lav Bay, even though Podstrana has sandy beaches, the bay in Lav is quiet and has all facilities required to have a fantastic day.